QUEENS — A Michelin-starred chef who runs a catering company is eyeing spaces for a possible restaurant — and her ideal spot would be near her home in Jackson Heights. Chef Surbhi Sahni and her business partner, Natalie Pinto, started Bittersweet NYC, a catering company, three years ago and have been working and baking out of an business incubator since then. But Sahni said she is hoping to open a small restaurant in Jackson Heights, her home for more than a decade and a place she says is lacking in new takes on various cuisines. 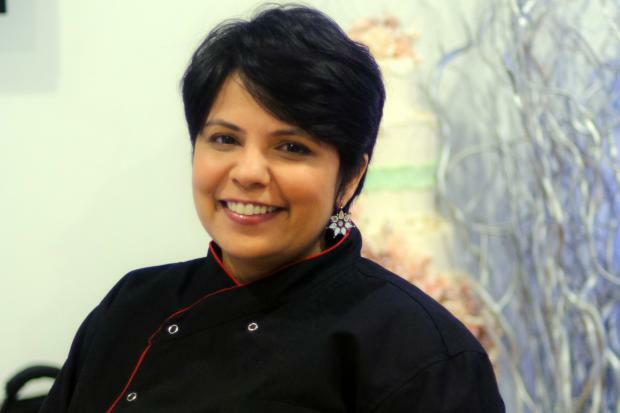 Sahni is the executive pastry chef at Tulsi in Midtown. Her big break, she said, was at Tamarind in 2001, where she was the executive pastry chef. She's also worked in the pastry kitchen at davidburke & donatella, was the executive pastry chef at Amma, and was the executive pastry chef at Dévi, which received a Michelin star in 2007 and 2008. In addition to creating custom wedding cakes and Indian-inspired desserts, she's branched out from serving just sweets at Bittersweet NYC. Their company's Samosa Bar —the first in New York, they say — has been featured at various street fairs and festivals. Bittersweet NYC has participated at the Hester Street Fair, the IDEASCITY Streetfest at the New Museum and, more recently, the Queens County Market, which was held in Sunnyside. They’ve also worked with the Jackson Heights CSA, and Sahni said her local work has encouraged her to start a permanent storefront in the area. Sahni, who lives in Jackson Heights with her husband and daughter, said the neighborhood has changed a lot since she moved there 12 years ago. “It's a lot more receptive to newer ideas and newer things. We are a complete mixed kind of group,” she said. Sahni said she’d like to find a location soon, and is exploring ways to fund her venture. She and Pinto are hoping to set up a Kickstarter page within the next few weeks, and while they’re exploring options around the city, they’d ultimately love to stay in Jackson Heights. You can order treats on the Bittersweet NYC website, and follow them on Twitter and Facebook.